It is with great pleasure to invite you to the 1st Eastern European Networking Congress for Trainees in Obstetrics and Gynaecology in conjunction with Faculty Members and Student Scientific Groups. It will be held at the Riga Stradins University, Riga, Latvia from 26 – 27 April 2019. The Conference is organized by the Riga Stradins University Interest group of Gynaecology and Obstetrics, Latvian Association of Trainees in Obstetrics and Gynaecology and Latvian Association of Obstetricians and Gynaecologists. The 1st Eastern European Networking Congress for Trainees in Obstetrics and Gynaecology is made in order to improve training skills in the field of Obstetrics and Gynaecology as well as scientific research and collaboration among Eastern European countries. 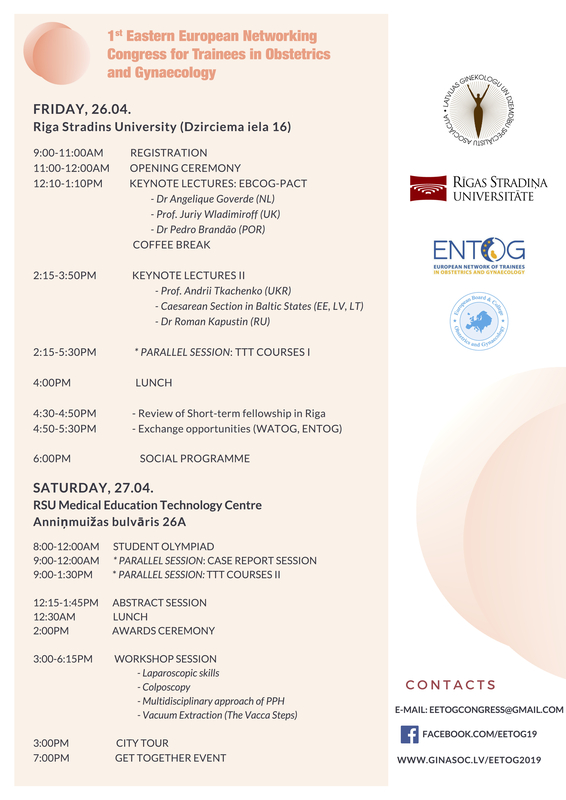 A practical Information note and a Registration form will be sent to you at a later stage and posted on the official website of the Congress (www.ginasoc.lv/eetog2019) and official Facebook page (www.facebook.com/EETOG19/). We are looking forward to meet you in Riga! Oral presentations must be presented in English. Presentations must be created in Microsoft Office Powerpoint *.ppt or *.pptx format (Microsoft Office 2013 compatible). Presenters take full responsibility of the presentation quality and file format. The first slide of the presentation should include the Title, Authors and Scientific research supervisor. The presentation should follow the same structure as the abstract. Presentation should last no longer than 8 minutes, followed by a 5 minute discussion. The presentation session coordinator has the right to interrupt any report or discussion after the given time has elapsed. Only one author can be the presenter (Active participant) and is obliged to participate in the discussion. Other co-authors (Passive participants) can also take part in the discussion. All other requirements for oral presentations also apply to case reports. A poster should be prepared as a vertically oriented A1 size paper (594 x 841 mm / 23.4 x 33.1”). Presentations should last no longer than 3 minutes, followed by a 2 minute discussion. Posters must be hung for display at the conference venue before the poster sessions. All other requirements for oral presentations also apply to poster presentations. Please remember to state your full name and Congress name "EETOG 2019" in payment details. The payment by bank transfer is available until 31 March 2019. Please notice that your bank or service might charge a fee for the transfer!